Hey guys! Last week I did a post all about love languages and why they are important/how they can help you get to know your characters better. Little did I know, my own advice has helped me discover the reason why I've been so frustrated with my two main characters lately. As most of you know, I've been working on my YA sci-fi, Unperfected, for over three years. It has gone through hundreds of edits and rewrites, all which have ultimately lead me to where I am now: rewriting the entire book in order to switch it from one POV (told from the lovely perspective of my MC, Avalon) to two POVs (the perspectives of Avalon as well as her boyfriend, Tripp). Doing so has opened up the storyworld immensely. I've created new plot lines, new characters, and the story itself has evolved and developed into something really amazing. My problem? Avalon and Tripp have been driving me crazy. Their relationship takes some heavy hits throughout the story, leaving my poor MCs heartbroken and frustrated with each other. And they will. not. cooperate. I can't seem to write them well together at all! When they are separated from each other, I can write their perspectives just fine. But oh, if they have to talk to each other in one of the chapters? It's awful. It sounds absolutely terrible and unnatural. I've been wanting to rip my hair out every time I sit down to write. But after last week's post on love languages, I realized something that (for some reason) I never realized before: I know Avalon and Tripp very, very well as individuals. But as a couple? Pssh. Not at all. And that's a problem. Sometimes us writers can get so focused on learning about our characters and developing them that we forget to develop the relationships those characters have. 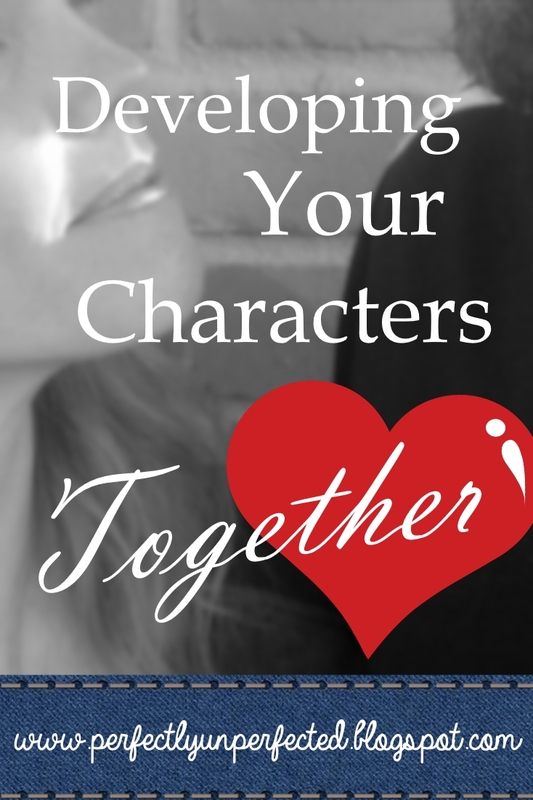 It's easy to develop a main character and a minor character separately, but what about their relationship? What about the dynamic of their friendship? Looking over my book now, I realize that Avalon and Tripp's relationship has only been half-developed. Because of all the changes that occur in the story, I only know Av and Tripp as a couple in the beginning of the story, before all the plot and character development. That's not good! And so, I've switched my focus in writing right now from getting the words down (as I've been doing) to taking a short break to develop my MC's as a couple. And to start, I put both of them through the love languages test. And I was very surprised by their results. As you can see, Avalon is pretty even for all of the love languages, with quality time being her primary language. That doesn't surprise me. Avalon is a pretty level-headed person, and she values spending time with people greatly. When people take time for her, she feels loved. But I'm also not surprised that her other scores were so close and that three of them all tied for her second highest language. That's just very . . . Avalon! She's appreciative of love and affection no matter what language that love comes through. Tripp's results, however, are what surprised me. Tripp highest is physical touch, which doesn't surprise me. What surprises me is how different his and Avalon's scores are. While hers are very even, Tripp's are very uneven! But after getting these results, I realized that they make a lot of sense regarding where I'm at with them in the book right now. Tripp is frustrated with a lot of things, but looking over his love languages makes me realize he's probably also very frustrated because his love languages of physical touch and quality time aren't being fulfilled. He and Avalon are apart a lot during the middle and second half of this book. But for Avalon, her love languages are being fulfilled, just not by Tripp or in romantic ways. Which is why I think Avalon has been mostly okay during all of these ups and downs in the plot, and Tripp hasn't. There's a lot of other reasons why one is okay and the other isn't, too, but still--this opened up a lot of insight for me! If you still haven't taken the love languages test for your characters, I highly recommend doing that here. As you can see, it can be very helpful! The next thing I plan to do to help me learn more about Av and Tripp as a couple is to fill out a couple's character questionnaire for them, which of course I'll share with you all on the blog. Until then, happy writing!